To receive the LL.M. degree, a minimum of two semesters of full-time study is required, together with the attendance of the Orientation program. A longer period may be occasionally necessary due to the nature of the candidate’s particular program of study, prior legal training, the quality of performance at the Law Center, or other factors. The residency requirement may be extended to include an additional summer session. Each candidate’s program of study is arranged on an individual basis between the candidate and the Assistant Dean for International Programs and is subject to the approval of the Associate Dean for Academic Affairs. During residency, candidates must earn a minimum of 26 semester hours of credit. Two credit hours allotted for Introduction to United States Law (required for all LL.M. candidates), and two credit hours for Legal Research and Writing I. The balance of the hours is allotted for regular courses, seminars, independent supervised research or any combination thereof. Degrees are awarded by the faculty upon the favorable recommendation of the Assistant Dean for International Programs, the Associate Dean of Academic Affairs, and the LL.M. Program Committee. To receive a favorable recommendation, the candidate’s work as a whole must exhibit sufficiently high quality and scholarly maturity. A minimum cumulative grade point average of 2.4 is required for regular courses and seminars. LL.M. students who do not earn a grade average of 2.4 at the end of the fall semester will be notified of the extreme difficulty to raise their average to a 2.4 cumulative average in one semester. 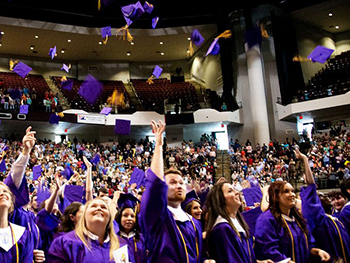 Any candidate who does not complete all program requirements by the end of the spring semester may not be eligible to fully participate in all graduation ceremonies.